-This toy storage box did not include dinosaur figures. - Please don't storage wet items and should be kept in dry environment. - Please do NOT washing it in water, you can use a small brush or wet cloth to clean the surface slightly if there are stains, then put the boxes in ventilated place until they are totally dry. 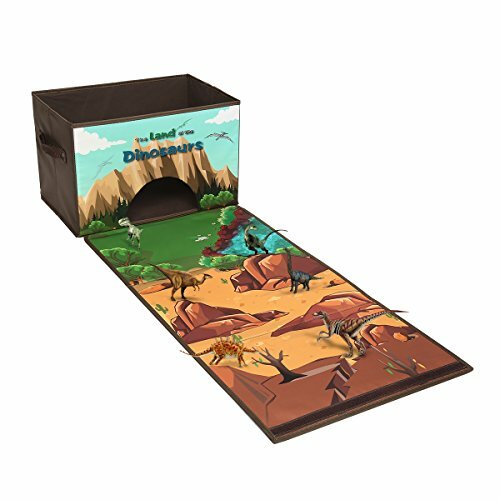 ★INTERESTING PLAY MAT: Our dinosaurs storage bins not only can meet your various storage needs but also can provide your children a magic space to play on. ★CONSIDERATE DESIGN:Storage box is large enough to hold dozens of small toys, a board game collection, or many pairs of shoes.The unfolded spread lid can be used as a play mat for children to play with their toys. ★SAFETY KID PROOF MATERIAL:Made from Polyester and cardboard, our dinosaurs toy storage bins is safety to use and play.